The Kennedys of Campsie. A complete study. An investigation into the Irish and Scottish origins of 8 Kennedy families. Update 16.9.08 Two of the families below appear on the Campsie parochial pauper rolls, for which see my separate article. This study has arisen from the Kennedy One-Name Study, a project to study all people bearing the surname Kennedy. One of the aims is to determine, for each family, whether it was a 'Scottish' or 'Irish' Kennedy family. Determining the origin of a Kennedy located in Scotland can be challenging. In some cases definite proof can be obtained, in other cases some heuristic determination may be made, pending harder proof. During the 19th century many people from Ireland came to Scotland to escape economic hardship and/or take advantage of the growth in jobs from the industrial revolution. These were a mixture of Catholic and Protestant workers. Whole books have been written about Irish migration to Scotland, I recommend a few under 'Further reading'. Lennoxtown, or Newtown of Campsie, was an industrial village that grew up from a small farming community after the introduction of industries such as alum mining and calico printing in the late 18th century. 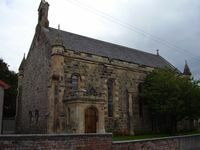 It is situated just north of Glasgow at the foot of the Campsie fells. In the 1920s the bottom fell out of the printing industry in the area and the main employer closed down. Most of the manual workers moved on. The numbers of Irish can be determined from several sources. The second Statistical Account for the parish of Campsie tells of the numbers who had arrived. The records of the Roman Catholic church tell how the first Catholic mass in Campsie since the Reformation was held in 1831 and the Catholic church of St. Pauls, later St Machans, opened its doors in 1846. The oldest surviving census returns for 1841 and 1851 record country of birth and from these it is simple to count the Irish born. St. Machans (formerly St. Pauls) Roman Catholic Church Campsie, established 1846. There are 33 Kennedys listed in the 1851 census, the index for which has been published by the Central Scotland Family History Society. Of these 15 are marked as born in Ireland. By comparing the entry numbers the Scottish born children of these Irish can be determined, showing that a further 7 - ie a minimum of 22/33 - are of Irish descent. I have investigated all these families by looking at all the birth, marriage and death certificates at New Register House in Edinburgh, and also using the registers of the Roman Catholic church in Campsie. In the notes that follow I will identify each family by the name of its matriarch as this is easier to follow than duplicated Kennedy names. The family of Bridget Shovelin (or Shovlin). Bridget married John Kennedy in Lennoxtown in 1879 but both are shown as Irish in the census. They had six children all born in the parish. They married in St Pauls Roman Catholic church . I have found marriages for four of the six children and they were all at St Machans Roman Catholic church (St Pauls was renamed in 1881). I don't have a direct record of where in Ireland they were from. However when Bridget died in 1936 the informant, her son William, gave an address of Drimalost, in Co. Donegal; and new information from a descendant tells us that the family is known to have come from nearby Mountcharles in Inver parish. John worked at the print works. Mary married James Kennedy in Inver parish in Co. Donegal in 1841. They arrived in Campsie shortly before the 1851 census which shows them in Main Street in Lennoxtown. James worked at the alum works. Later they moved to the village of Milton of Campsie. I have found 8 children, the first 5 born in Co. Donegal and the last 3 in Campsie. So far I haven't found a Scottish marriage for any family member to determine if they were Catholic, most of the children died before adulthood. Update 12th March 2008: Michael Kennedy, one of the sons of this family, applied for Poor Law Relief in Glasgow on 17th August 1871, when he and his mother Mary O'Donnell were living in Trafalgar Street, having left Campsie three years earlier (ie 1868). Michael had been working at the Barrowfield printworks but had succumbed to consumption (TB). Although he was awarded poor relief, he died a few months later on 27th December 1871. Catherine married William Kennedy in Glenties in Co. Donegal in 1853. The family arrived in Campsie in the late 1860s where William became an alum worker. Again no Scottish marriages with three sons dying single in adulthood. There were 7 children in total, the first 5 born in Ireland. Catherine married William Kennedy in Downpatrick in Co. Down in 1866. They had 5 children in Ireland before moving to Campsie around 1870 where they had another 4 children. William was a printfield labourer. The only Scottish marriage in this family was with the Church of Scotland. This ties in with reports in the OS Memoirs for the Downpatrick area being mostly Protestant. Not surprisingly then, it is the only marriage easily found amongst the records of the Irish Record Office in Dublin (most of the others are Catholic marriages before commencement of Catholic registers in their parishes). This tells us that William (or Wilson as he was known) was the son of James Kennedy, a farmer. This is useful as his Scottish death certificate oddly recorded his mother Elizabeth Wilson's name but not his father. Both parties recorded their ages as simply 'full age'. They both appear to have come from the parish of Kilmore; Catherine Pat(t)on from Listooder and Wilson/William Kennedy from the neighbouring townland of Drumgiven. Jane married William Kennedy in Barrhead in Renfrewshire in a Church of Scotland ceremony. The family moved to Campsie about 1881 when William got a job as a colour mixer at the printworks. They lived at Craighead in Milton of Campsie. Their recent history appears to be purely Scottish although William Kennedy's mother was a MacAulay, a name that can occur in Ireland as well as Scotland. More work is need to trace this line back to be sure. They had at least 10 children, 3 in Renfrewshire and 7 in Campsie. Two brothers John and James married two cousins both called Margaret Clark(e). They were Scottish, having come down to the lowlands from Highland Perthshire. All this family's marriages were in presbyterian Church of Scotland churches. They all worked at the Lennoxtown printworks. They had 16 children between them, all born in the parish. Sarah married Joseph Kennedy in Donaghmore, Co. Tyrone in 1860. They moved to Campsie straight afterwards, where they had 5 children. It looks as if Joseph was already living in Campsie and is listed in the 1851 census, but Sarah is not apparent. Originally Joseph was a brick maker but described as a baker on his death certificate; his sons were all printworkers. One of his sons William moved to Bonhill and raised a family there. His occupation was later given as worker in a sewing machine factory, presumed to be the Singer works (an unrelated Kennedy family who I know worked at Singers were 2 doors away in Main Street, Bonhill). Another son Joseph also moved there, marrying another Kennedy and raising a family in Bonhill. Catherine married Michael Kennedy in Campsie in 1856 at St Pauls Roman Catholic church. Michael was born in Ireland and listed in the 1851 Campsie census as a printwork labourer. He appeares to only have had a small family of 2 daughters both of whom died in childhood. His county of origin in Ireland has not yet been determined. Join my Kennedy DNA project!! If anyone is or knows a male Kennedy descended from these or related groups contact me about genealogical DNA testing or join up here. Entry is FREE to any male Kennedy descendant of the above families! Irish - the remarkable saga of a nation and a city, John Burrowes 2003. A popular style book about the impact of the Irish on Glasgow. (1) Yes, it only adds up to 6. There is one family who are Irish but I haven't found the county of origin; and 1 is recently Scottish but requires further investigation.